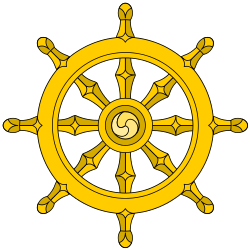 The Dhatukatha (dhātukathā) is a Buddhist scripture, part of the Pali Canon of Theravada Buddhism, where it is included in the Abhidhamma Pitaka. This book combines ideas from the two preceding abhidhamma books, the Dhammasangani and Vibhanga. It is in the form of questions and answers, grouped into 14 chapters by form. Thus the first chapter asks of each item covered, "In how many aggregates, bases and elements is it included?" Later chapters progress to more complex questions like "From how many aggregates etc. are the dhammas dissociated from the dhammas associated with it dissociated?" This article is issued from Wikipedia - version of the 3/6/2014. The text is available under the Creative Commons Attribution/Share Alike but additional terms may apply for the media files.